"This is a huge amount of methane lost from the glacial meltwater stream into the atmosphere," said Dr. Peter Wynn, a glacial biogeochemist from the Lancaster Environment Centre and corresponding author of the study. "It greatly exceeds average methane loss from non-glacial rivers to the atmosphere reported in the scientific literature. It rivals some of the world's most methane-producing wetlands; and represents more than twenty times the known methane emissions of all Europe's other volcanoes put together." Dr. Wynn added: "Methane has a global warming potential 28 times that of carbon dioxide (CO2). It is therefore important that we know about different sources of methane being released to the atmosphere and how they might change in the future. "There has been a lot of speculation about whether or not glaciers can release methane. The beds of glaciers contain the perfect cocktail of conditions for methane production—microbes, low oxygen, organic matter and water—along with an impermeable cap of ice on the surface trapping the methane beneath. "However, nobody has thoroughly investigated this in the field before and this is the strongest evidence yet that glaciers are releasing methane." The study comes out of Ph.D. research carried out by Dr. Rebecca Burns when she was a graduate researcher at Lancaster University through the Centre for Global Eco-innovation, part-funded by the European Regional Development Fund. 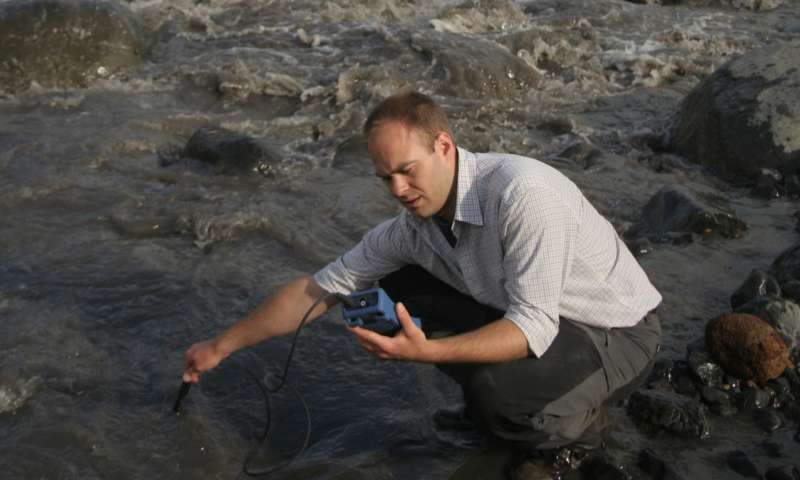 Dr. Burns took water samples from the edge of the melt water lake in front of the Sólheimajökull glacier and measured the methane concentrations, comparing them with methane levels in nearby sediments and other rivers, to make sure that the methane wasn't being released from the surrounding landscape. "The highest concentrations were found at the point where the river emerges from underneath the glacier and enters the lake. This demonstrates the methane must be sourced from beneath the glacier," Dr. Wynn explains. Using a mass spectrometer, which identifies the unique 'fingerprint' of the methane, the researchers discovered the methane is coming from microbiological activity at the bed of the glacier. But there is still a connection with the volcano. "We believe that while the volcano is not producing the methane, it is providing the conditions that allow the microbes to thrive and release methane into the surrounding meltwaters," Said Dr. Wynn. 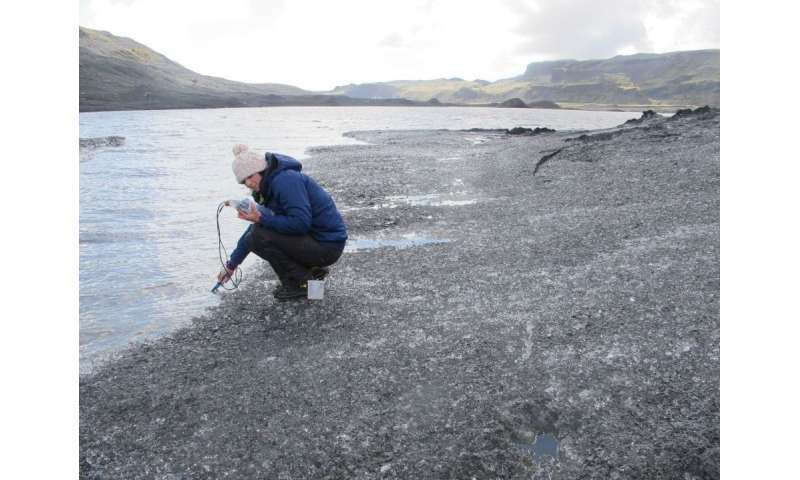 "Understanding the seasonal evolution of Sólheimajökull's subglacial drainage system and how it interacts with the Katla geothermal area formed part of this work", said Professor Fiona Tweed, an expert in glacier hydrology at Staffordshire University and co-author of the study. Dr. Hugh Tuffen, a volcanologist at Lancaster University and co-author on the study, said: "The heat from Katla volcano may greatly accelerate the generation of microbial methane, so in fact you could see Katla as a giant microbial incubator. "Scientists have also recently discovered that Katla emits vast amounts of CO2—it's in the top five globally in terms of CO2 emissions from volcanoes—so Katla is certainly a very interesting, very gassy volcano." "Both Iceland and Antarctica have many ice-covered, active volcanoes and geothermal systems," said Dr. Burns. "The recent International Panel on Climate Change (IPCC) report highlights that current trajectories indicate global warming is likely to reach 1.5oC between 2030 and 2052, with greatest perceived climate sensitivity at higher latitudes. If methane produced under these ice caps has a means of escaping as the ice thins, there is the chance we may see short term increases in the release of methane from ice masses into the future." Andri Stefánsson, Professor of Hydrothermal Geochemistry at the University of Iceland, who was not involved in the study said: "These findings provide important and new information on the origin and fluxes of methane at the Earth's surface and the significance of this greenhouse gas to the atmosphere from such systems. "These findings provide important and new information on the origin and fluxes of methane at the Earth's surface and the significance of this greenhouse gas to the atmosphere from such systems." -Mercy me another major new factor in global warming that nobody knew about. And I thought this was all settled science.